Sleeping Giant - the sculpture by Belize sculptor George Gabb and denomination 20. George Gabb's epic art piece, The Sleeping Giant, has become the face of the Belize Documentary Series called Belize Legends. For many Belizeans at home and abroad, it portrays a humble and proud people, who many have come to believe presents a laid back personality, that appears quite submissive and apathetic. Until it wakes up and breaks up the circus. There is a Belizean saying that goes: "Belize brukup bigga circus dan dat!" Oh, what a day when the Sleeping Giant awakes! HM The Queen Elizabeth II. 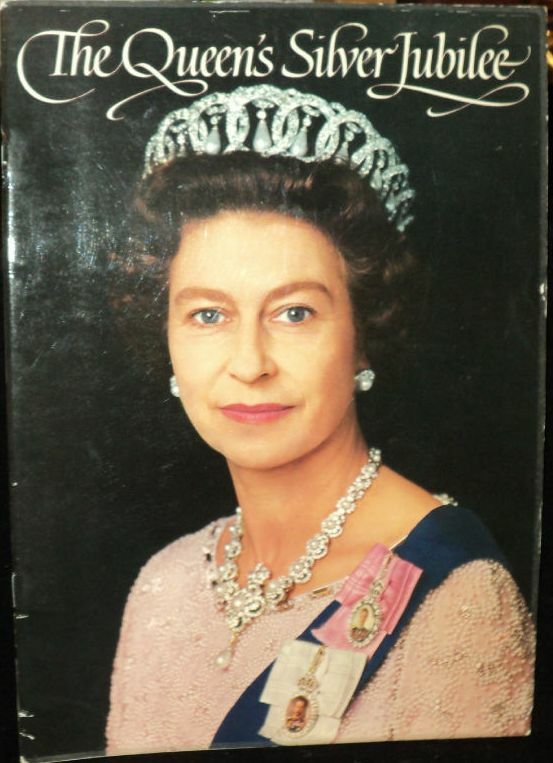 The photograph that was used of the Queen was taken in April 1975 by the late Reading-based photographer Peter Grugeon and later released for official use during the Silver Jubilee in 1977. 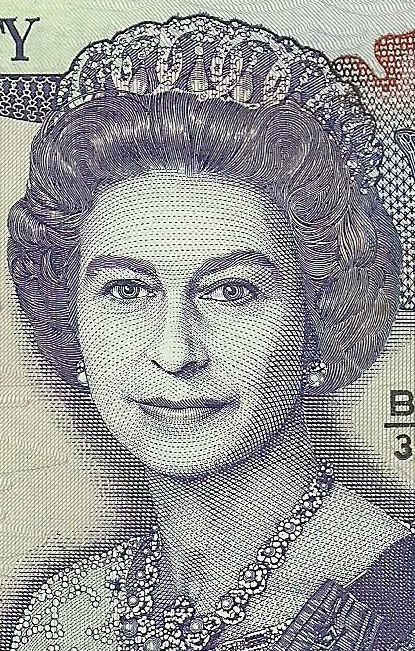 It is one of the more popular images of The Queen. (Peter Symes). 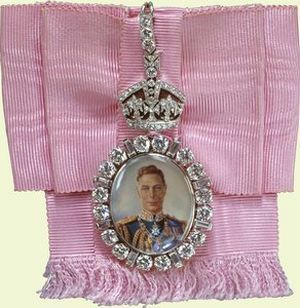 Her Majesty is depicted wearing Grand Duchess Vladimir's tiara, Queen Victoria's Golden Jubilee necklace, the Royal Family Orders of King George VI and George V and Queen Alexandra's Wedding Earrings. 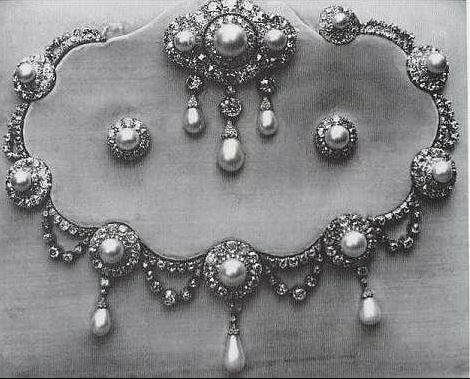 The Grand Duchess Vladimir Tiara. No tiara is complete without a fascinating backstory, and this one's even got a daring escape. Made by Bolin, it glittered at the Russian royal court on the head of Grand Duchess Vladimir until the revolution, when it was left behind as the family fled. A British agent and friend smuggled it out of Russia to rejoin the exiled Grand Duchess and her collection. After her death, the tiara was bought from her daughter by Queen Mary. It's worn often today by the Queen with pearl or emerald drops, or occasionally with no drops. The pearl drop option has been the most popular with the Queen in recent years, probably owing to her love of white gowns in the evening and accompanying white jewels. To mark Queen Victoria’s Golden Jubilee in 1887, a committee of ladies was formed to raise money for a commemorative statue of Victoria’s late husband Prince Albert. The committee’s fundraising was quite successful, and they ended up raising far more than was required for the statue. An agreement was formed with the Queen that the excess should go to the St. Katherine’s Fund for Nurses. 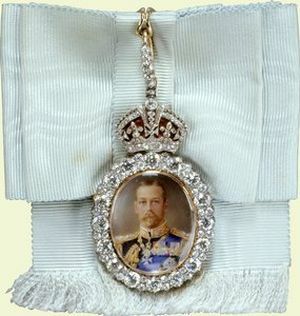 At the same time, some members of the committee decided that a portion of the funds should be used to purchase a necklace for the Queen - and this was also approved by Her Majesty. The trouble was, the committee did not agree on the necklace. Some felt it would be wrong to spend the funds which had been previously devoted to charity on something else. Much discussion and debate ensued, as is described in depth in Hugh Roberts’ book The Queen’s Diamonds. (My favorite tidbit: Queen Victoria, angry that she wouldn’t get her promised necklace, shot down the prospect of a diamond badge commemorating the nursing fund by declaring she would “at once exchange it for another jewel”. 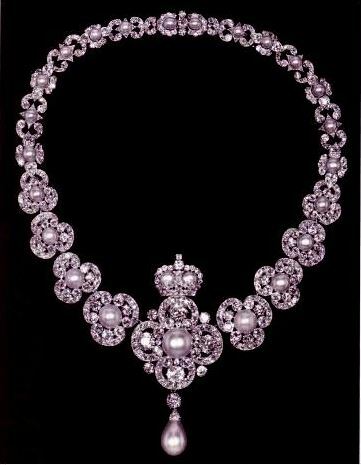 In the end, a compromise was reached and this necklace, made for £5000 (far less than the necklace originally proposed) from gold, diamonds, and pearls by Carrington & Co. was presented to Queen Victoria in 1888. It features a central quatrefoil diamond motif with a large pearl in the middle, topped by a crown and underlined with a drop pearl. The next four links in either direction are graduated trefoil motifs; the central piece and the six largest trefoils can also be worn as brooches. She is also wearing Queen Alexandra’s Cluster Earrings. The wedding gift from the future King Edward VII to his bride, Alexandra of Denmark. Also known as Queen Alexandra's Cluster Earrings, these two button earrings have large pearls surrounded by diamonds - 10 larger stones each plus smaller filler stones to create a full diamond ring. Like the brooch, these passed to the Queen via Queen Mary. They're now worn primarily at evening functions. Baird's tapir (Tapirus bairdii) - National animal of Belize. 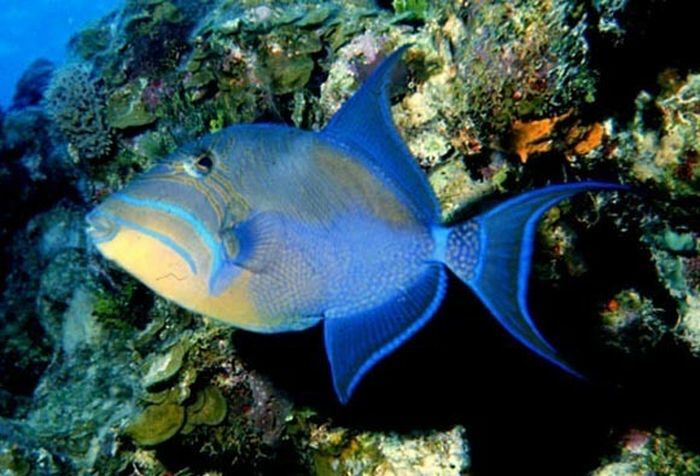 Also in the design of blue and gold tones, in lower left corner, Royal Triggerfish. Triggerfishes are about 40 species of often brightly colored fishes of the family Balistidae. Often marked by lines and spots, they inhabit tropical and subtropical oceans throughout the world, with the greatest species richness in the Indo - Pacific. Most are found in relatively shallow, coastal habitats, especially at coral reefs, but a few, such as the aptly named oceanic trigger fish (Canthidermis maculata), are pelagic. Centered are The Atlantic spadefish (Chaetodipterus faber) is a species of marine fish endemic to the western Atlantic Ocean. They are commonly found in shallow waters off the coast of the southeastern United States and in the Caribbean. 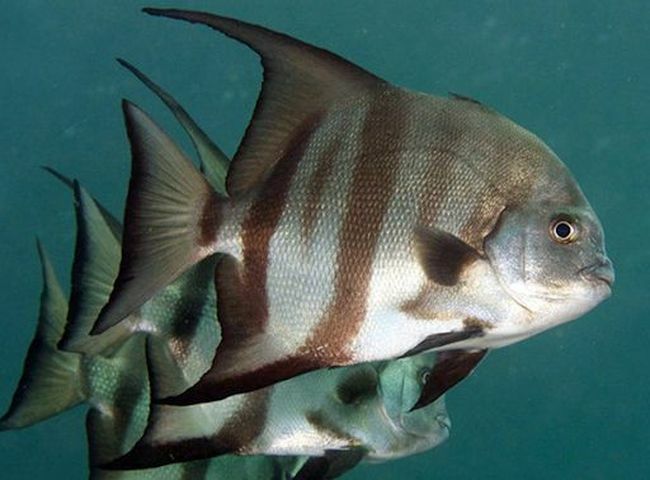 The Atlantic spadefish has a very deep, compressed, disk-shaped body and a blunt snout. he body is silver in color with irregular black vertical bands that fade gradually with age. The Atlantic spadefish is known by numerous colloquial names, including angelfish, white angelfish, threetailed porgy, ocean cobbler, and moonfish. On the left side is coat of arms of Belize. 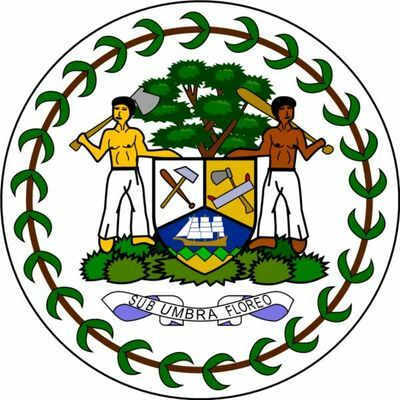 The Coat of Arms of Belize was adopted upon independence, and the current coat of arms is only slightly different from that used when Belize was a British colony. The circular border of the coat is formed by twenty-five leaves. Within the circle is a mahogany tree, in front of which is a shield tierced per pall inverted. Within the shield are the tools of a woodcutter in the upper sections and a ship in the lower one. These are symbolic of the importance of mahogany in the 18th and 19th century Belizean economy. The shield is supported by two wood-cutters of different races. The one on the left is holding an axe, while the one on the right is holding an oar. Again the importance of the mahogany and its importance to boat building are represented. At the bottom is the national motto: "SUB UMBRA FLOREO" (Under The Shade I Flourish). 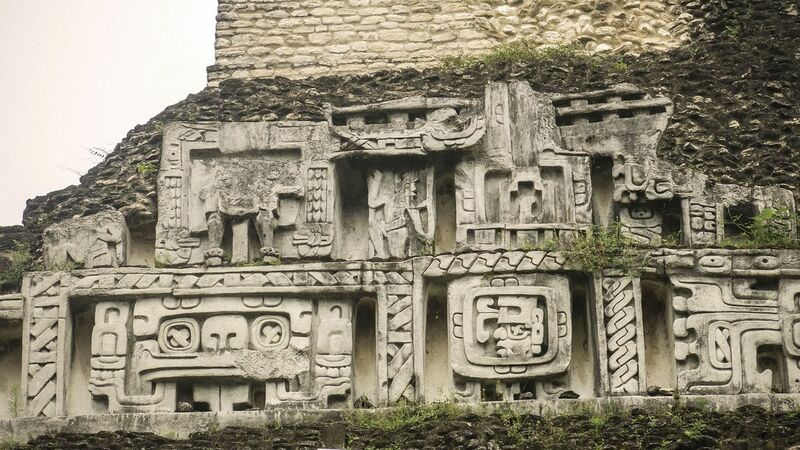 In the upper left corner is the sun god of Maya Indians - Kinich Ahau (Jade head). Kinich Ahau - The Maya Sun God. 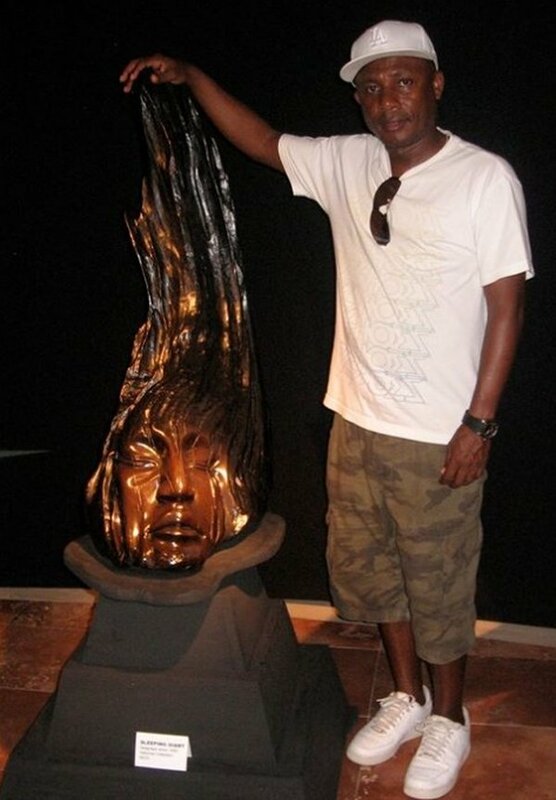 Ever since its discovery, the jade head has been the subject of much controversy among Belizeans. For years most of us have believed that, shortly after its discovery, this unique Maya masterpiece was spirited out of the country and never returned to its rightful home. The fact is that this priceless jade head is always in Belize under secure guard except when it is loaned for specific archaeological exhibitions abroad. The jade head was discovered at in the Belize District's Maya site of Altun Ha in 1968 by Dr. David Pendergast of the Royal Ontario Museum of Canada. The head, along with forty other objects, had been placed within a large tomb that was located below the stair block on the Temple of the Masonry Altars. At the center of the tomb were the remains of an elderly adult male. This elite person was likely an important ruler of the site during his lifetime and may have commissioned an artist to produce the large carved object. We do not know the exact date that the head was carved, but analysis of cultural remains within the tomb suggests that the burial, and accompanying grave goods, were deposited in the structure sometime between 600 and 650 A.D. Despite its small size and seemingly marginal location, Altun Ha was an ancient Maya community of great complexity and wealth. It was an important link in the coastal trade routes, and had contact with the distant city of Teotihuacan in present-day Mexico at an early time in Maya history. The earliest evidence of settlement at Altun Ha dates to 200 B.C, although it is highly probable that nomadic hunter and gathering tribes lived in the area long before then. Weighing 9.75 pounds and standing almost 6 inches high, the jade head remains the single largest carved jade object yet discovered in the Maya area. Its crossed eyes, fang-like elements on either side of the mouth, and the ahau glyph on the forehead all identify the head as a representation of the Maya sun god Kinich Ahau. Along with Chac (rain god) and Yum Kax (corn god), Kinich Ahau was among the most important deities in the Maya pantheon. Picture: Three different views of the Kinich Ahau jade head. 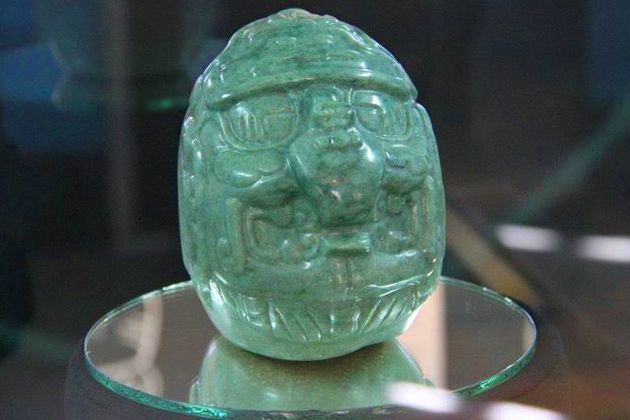 The Altun Ha jade head is truly a remarkable object and exquisite work of art. It is the only one of its kind in all of Mesoamerica. Because it was carved with nothing more than stone tools, we know that it may have taken many months, if not years, to produce. It was also carved from one large solid piece of jade that was imported from the Motagua River Valley region of Guatemala. Jade was also the most precious of stones to the Maya. Beside its exotic origins, its green colour reflected that of water and the corn plant, the two most precious, life sustaining substances to the ancient Maya of northern Belize. Silver Triggerfish is in lower left corner. On the left side is Jabiru stork in the flight. The jabiru (Latin: Jabiru mycteria) is a large stork found in the Americas from Mexico to Argentina, except west of the Andes. It is most common in the Pantanal region of Brazil and the Eastern Chaco region of Paraguay. It is the only member of the genus Jabiru. The name comes from a Tupi-Guaraní language and means "swollen neck". Jabiru are widespread but not abundant in any area. They are considered a species of least concern by the IUCN, an improvement from a status of near threatened in 1988. 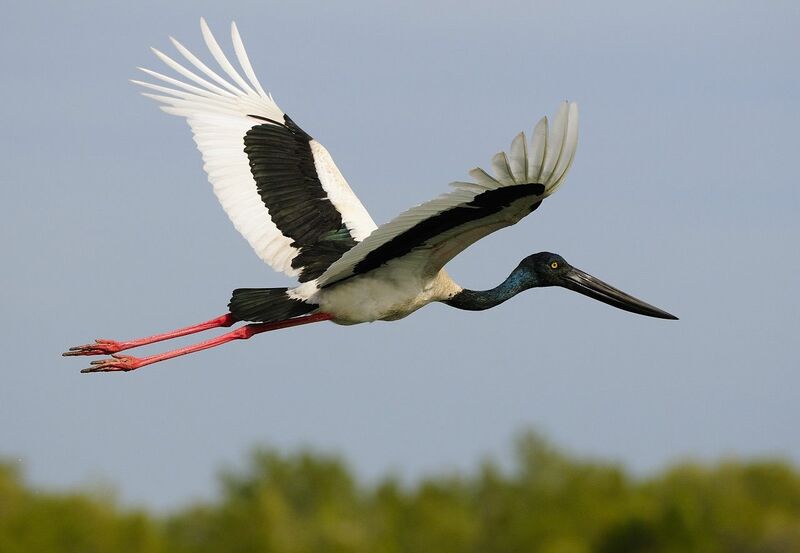 Jabiru gained protected status in Belize in 1973. Since then, their numbers in that area have slowly risen. They have been granted protected status by the U.S. Migratory Bird Act. Denominations in numerals are in three corners. in words is centered, at the top. On the side strip, on the left side, is Baird's tapir (Tapirus bairdii). It is a species of tapir native to Central America and northern South America, one of four Latin American species of tapir. The tapir is the largest land mammal in Central America. 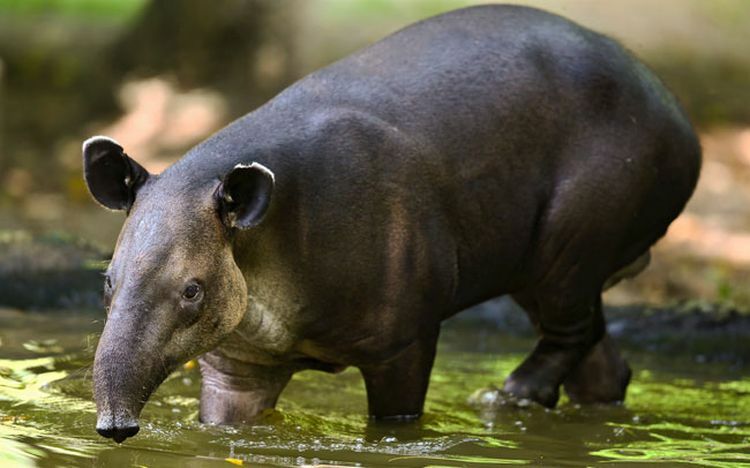 Like the other Latin American tapirs (the mountain tapir and the South American tapir), Baird's tapir is commonly called danta by people in all areas. In the regions around Oaxaca and Veracruz, it is referred to as the anteburro. Panamanians, and Colombians call it macho de monte, and in Belize, where Baird's tapir is the national animal, it is known as the mountain cow. Above him is Toucan. Toucans are members of the family Ramphastidae of near passerine birds from the Neotropics. 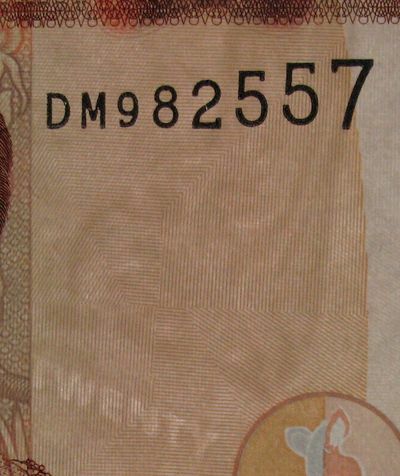 They are brightly marked and have large, often colorful bills. The family includes five genera and about forty different species. The name of this bird group is derived from the Tupi word tukana, via Portuguese. 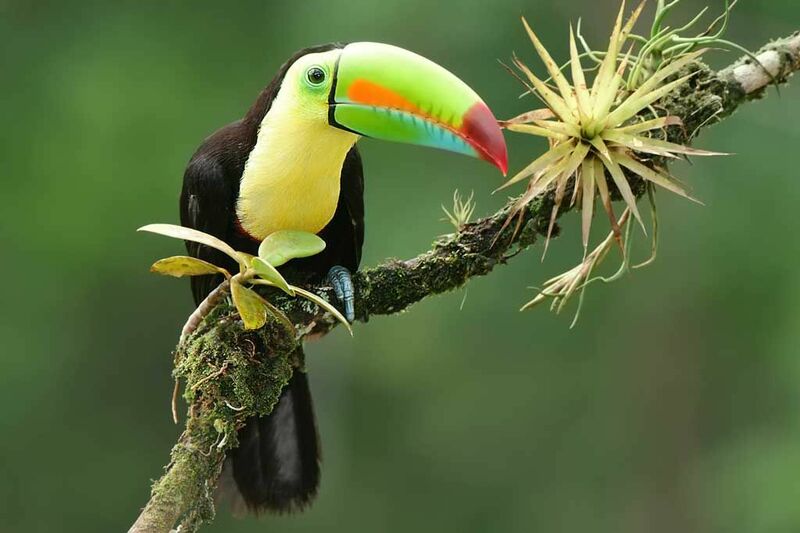 Toucans are native to Southern Mexico, Central America, the northern portion of South America, and the Caribbean region. They generally live in tropical and sub-tropical regions. Above is Prosthechea cochleata or Black Orchid - the national flower of Belize. Native to Central America, the West Indies, Colombia, Venezuela, and southern Florida. Each oblong discoid pseudobulb bears one or two linear nonsucculent leaves. The flowers are unusual in that though the labellum is usually below the column in the orchids, in the members of Prosthechea the labellum forms a "hood" over the column. This makes the flower effectively upside down, or non-resupinate. 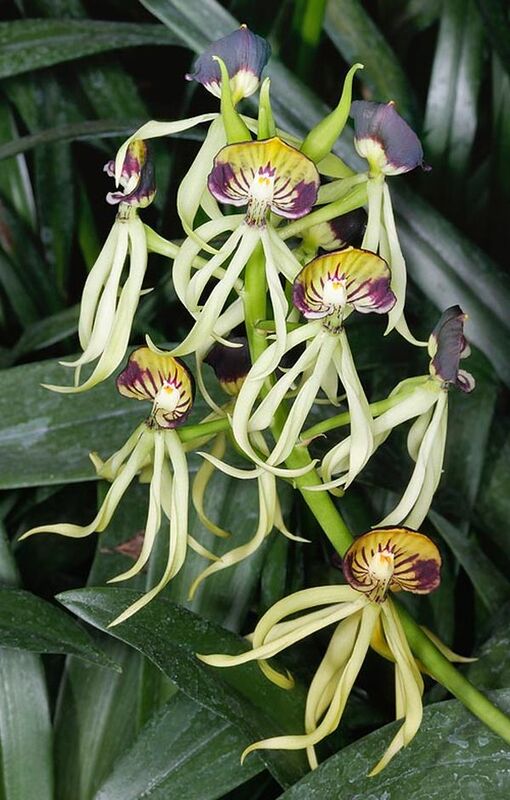 Whereas the species usually has one anther, Prosthechea cochleata var. triandra is an endangered variety that has three anthers and is autogamous, allowing its existence in Florida where no appropriate pollinators appear to be present. Lower, in red color, is design of the craving of an arch, from the site of Xunantunich, situated in the Cayo District. Denominations in numerals are in three corners. in words in lower right corner. 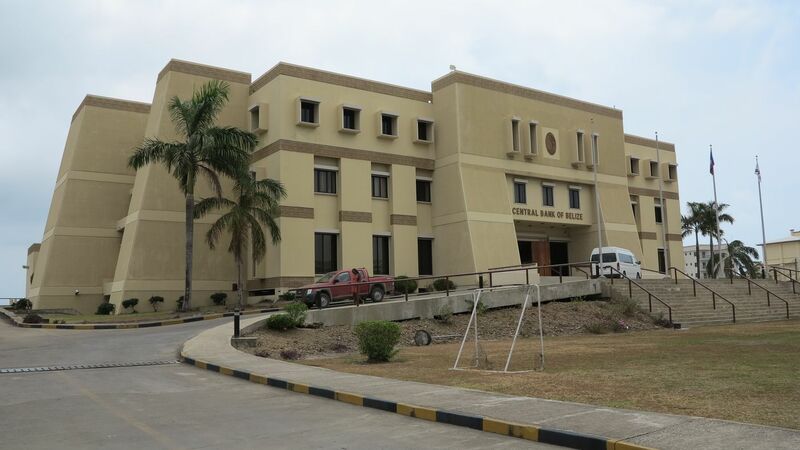 Theme: 30th Anniversary of the Central Bank of Belize. The De La Rue engraving, as well as reflecting the differences mentioned in Portrait 17a, also represents The Queen with a more cheerful aspect, achieving this through slight differences around Her eyes and lips. 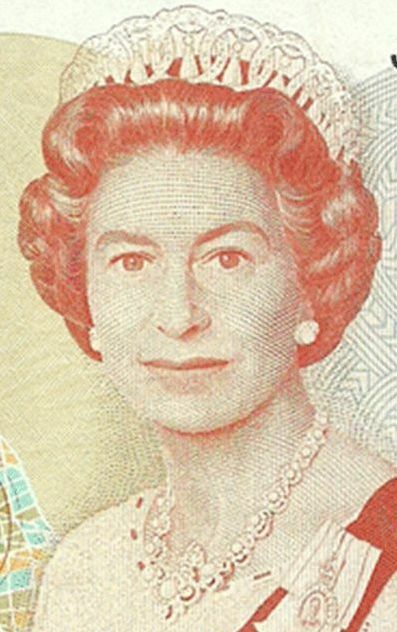 Bradbury Wilkinson's version of this portrait has less shading on The Queen's neck just above Her necklace, than is apparent on the De La Rue engravings (Portrait 17b). There are other subtle variations to the second version, noticeably in the patterns on Her Majesty's dress. Culture of Belize dates back to the origins of the Maya Indians, whose descendants still live in the country. Priceless historical heritage which - the temples and palaces of the great civilization. Most major centers of the Maya extant are: Shunantunich (on the border with Guatemala), Altun Ha, Caracol, Quay, Lamanai and others. These ancient cultural centers are not known until the end and they represent great value for historians and archaeologists. Stepped pyramids, huge masks and reliefs on temple walls Lamanai, mysterious and picturesque Lubaantun, in which was found the famous, the controversial scientists crystal skull. In the town of Cahal Pech can see a lot of famous Maya's "false arches", constituting one of the mysteries and the characteristics of Maya architecture. Altun Ha, one of the largest archaeological centers in the country, known for its burial, in which were found exquisite ornaments of jade and sea shells. Also of interest are national parks and reserves of the country, including the world's only jaguar reserve.